Armonia Lombardi first appears in the Painesville, Ohio, area in 1894. 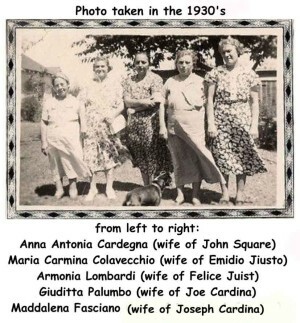 In America, Armonia Lombardi was known as Anna Lombary, then after she married, Anna Juist. Armonia Lombardi, daughter of Donato Antonio Lombardi and Maria Giuseppa Battista, was born on November 5, 1891, at Casalciprano, Italy. She married Feliceantonio Giusti, son of Domenico Giusti and Emerenziana Scacciavillano, on January 7, 1909 at Painesville, Lake County, Ohio. Armonia died on November 13, 1965 at Lake County Memorial Hospital at Painesville, Lake County, Ohio, at age 74. Her body was interred at Riverside Cemetery at Painesville, Lake County, Ohio. Armonia Lombardi immigrated to the United States at age one year on January 4, 1893. Her father had previously established residence in Pennsylvania. He returned to Italy and re-entered the United States (January 4, 1893) with his wife and daughter. The Lombardi’s were among the first Italians to reside in Painesville. Armonia Lombardi Guisti became a citizen of the United States on August 27, 1943. At the time of her death, Armonia resided at 316 Fairport-Nursery Road, Painesville Township, Lake County, Ohio. 1. Dominic A. Juist was born on October 20, 1909, at Painesville, Lake County, Ohio. He married Concetta Inchiostro, daughter of Gaetano Inchiostro and Concetta Barbera. Dominic died on January 28, 1991 at Lake County Memorial Hospital at Painesville, Lake County, Ohio, at age 81. His body was interred at Riverside Cemetery, Section 5, Lot 250, Grave 2, at Painesville, Lake County, Ohio. 2. Nancy M. Juist was born on January 15, 1911, at Painesville, Lake County, Ohio. She married John J. Gromofsky, son of Martin J. Gromofsky and Anna Stefanic, on November 7, 1950 at Lake County, Ohio. Nancy died on February 7, 2003 at Madison Health Center at Madison, Lake County, Ohio, at age 92. Her body was interred at Riverside Cemetery at Painesville, Lake County, Ohio. 3. Donald A. Juist was born on February 26, 1913, at Painesville, Lake County, Ohio. Donald died on December 27, 1992 at Lake County Memorial Hospital at Painesville, Lake County, Ohio, at age 79. His body was interred at Riverside Cemetery at Painesville, Lake County, Ohio. 4. Marie Juist was born in 1916. 5. Joseph J. Juist was born on November 4, 1918, at Painesville, Lake County, Ohio. He married Kathryn Deal on July 7, 1948. Joseph died on May 4, 1951 at Ohio State University Hospital at Columbus, Franklin County, Ohio, at age 32, of leukemia. He was in the OSU Hospital for 36 days. His body was interred at St. Mary Cemetery at Painesville Township, Lake County, Ohio. His death certificate indicates burial at Evergreen Cemetery, but has grave marker at St. Mary Cemetery. 6. Felix Anthony, son of Feliceantonio Giusti and Armonia Lombardi, was born on February 20, 1921, at Painesville, Lake County, Ohio. He married first, Betty Rippa, daughter of William Rippa and Minnie Braski. Felix was later divorced from Betty Rippa on July 21, 1961 at Ashtabula, Ashtabula County, Ohio. He married second, Margie Argo Prater, daughter of Jesse Argo and Gladys Bouldin, on Monday September 14, 1964 at Perry, Lake County, Ohio. Felix was later divorced from Margie Argo Prater on March 28, 1968. He married third, Maud Rudge, daughter of William Rudge and Mary Jane Heseltine, on Friday July 12, 1968 at Mentor, Lake County, Ohio. After the death of his third wife, he married fourth, Dolores Irene Figiel in December, 2002 at Lake County, Ohio. Felix Anthony died on April 18, 2013, at his home, Madison, Lake County, Ohio, at age 92. 7. Mark Peter Juist was born on March 20, 1923, at Painesville Township, Lake County, Ohio. Mark died on November 25, 2006, at Harbor Care Assisted Living, Fairport Harbor, Lake County, Ohio, at age 83. His body was interred at Riverside Cemetery at Painesville, Lake County, Ohio.